We offer Scotland’s first and only award winning, non-lethal and humane alternative to pest control. We will not use poisons or other harmful chemicals making us family, garden and pet friendly. We can also offer a discreet service with unmarked vehicles so no one knows that you have a wildlife problem. Initial Wildlife call outs cover a 2 hour period whilst follow up calls cover a 1 hour period. Ongoing e-mail/telephone support is always there for clients who have had a call out a no extra cost. We will always use non-lethal actions to solve conflicts and will not consider extermination of wildlife at any point. Please contact us for a quote if you require our services. We can offer another first for Scotland, our cat repellent service. Due to the demand of calls from clients who have troubles with their neighbours cats. We now offer a service where we can help you, if cats are causing you trouble and you no longer know what to do about it. We help with our humane, non-lethal, natural approach by repelling, deterring and in some case making your garden cat proof. The service will also act as a mediation between you and the cats owners to help solve the problem. As we love animal, the methods we use will cause no harm or distress to any cats. So call us today. Current pest control methods of removing foxes don’t work. 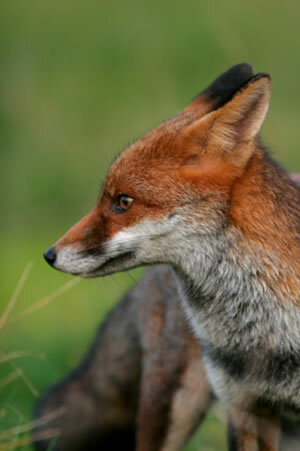 Killing the fox will only open your garden, their territory to new foxes to come in, therefore not solving the problem. Removing foxes and releasing them it can be very stressful and dangerous for the fox and is also illegal under the Abandonment of Animals Act 1960 and is condemned by the government’s Department of Environment, Food and Rural Affairs (DEFRA). The reason being is it will be dropped into another foxes territory and be chased off and hounded by other foxes as it moves through their territories. Our methods of repelling and deterring them from coming into the area are the only humane methods. Consultation fees apply and start from £10 for domestic calls and from £20 for commercial calls. This service is only for those over 100 miles away.